I stayed two days in Tempe while I got an emissions test on Minnie and waited for the winds to die down. Wind is probably the most dreaded condition for driving that I experience. Give me mountains, bad road, or rain to drive in and I will take them over high wind any day. Forecast for Wednesday looked good in the morning so I loaded up and headed for places east. 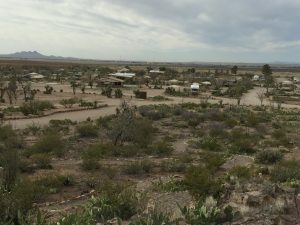 My first stop was near Tombstone, AZ on a forest road about 10 miles from town. The free campsite was quite nice, and I would probably spend a few days there if I was just wandering around, but I had a destination in New Mexico picked out to provide me with suitable temperatures for a few days. Tombstone is in high desert so the temperature got down quite chilly at night. The only other drawback to camping on this forest road was 8 miles of washboard dirt road. Anyone that has experienced washboard roads in an RV will know how cruel they can be. 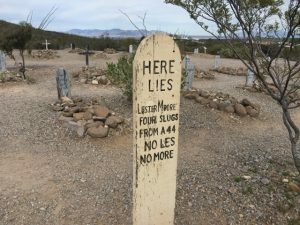 The next day I headed for New Mexico after the obligatory stop to see Boot Hill Cemetery. The last time I was at the cemetery was when I was a kid and Mom and Dad took the family there for an outing. I tried to imagine what it was like to live in a wild western town where many of these men met violent death from a bullet or at the end of a rope, but I couldn’t really. I spent half an hour reading some of the headstones and comparing my pamphlet to the graves and then left before I was blocked in in the small parking lot. Interstate 10 from Benson to Deming is generally boring, flat terrain of a lot of high desert. 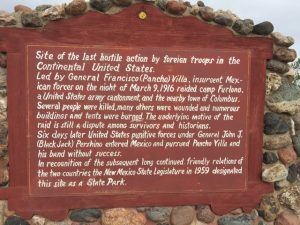 It seemed to take forever to drive the 200 miles to my destination of Pancho Villa State Park about 30 miles south of Deming New Mexico. My GPS wanted to go by way of a few southern roads but I overruled her and elected to stay on the interstate until Deming, adding a few miles to the trip but gaining better roads. I sometimes like to get off the interstate but traffic usually piles up behind me when I do. Mexico just off in the distance. I snagged the last non-electric site at the park and set up camp. Pancho Villa State Park is not very pretty. There is no lake or river or mountains or forest to speak of and the terrain is mostly flat desert. The main reason I’m here is to enjoy the weather. 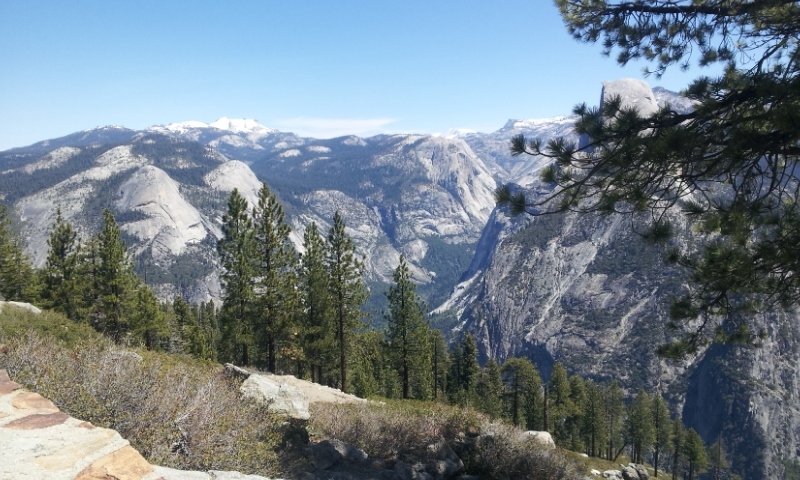 The park is at 3500’ and just about perfect this time of year. 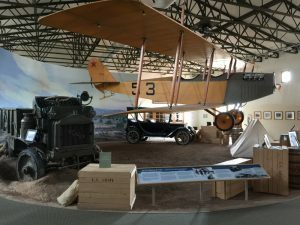 I have been exploring the park and visitors center and learning about the history of the Pancho Villa raid in 1916. The visitors center is very nicely done. It’s an interesting place with history that few people know about. I don’t know any history of Mexican American wars. I’m fully satisfied with your photos and recap of this site, and won’t need to go there myself to learn more. 😉 Enjoy the beautiful weather! Right Donna. For you to come down here would be the same as staying where you are. Trading one desert for another. EIGHT MILES OF WASHBOARD ROAD? OMG! I couldn’t do that. A mile is about all I’ve ever done and I kept thinking about all the screws winding loose throughout the rig. I really liked Pancho Villa when I was there. Nice walk to town, which doens’t have anything open, but I still enjoyed the walk. And just walking around the park is interesting. There were always owls there, sometimes nesting with babies. I got some good pics of that. And a day trip for a few hours across the border for lunch, which I probably wouldn’t do now.